Sor's Seguidillas are now very well known and have been recorded from this famous 1976 Tecla edition several times. 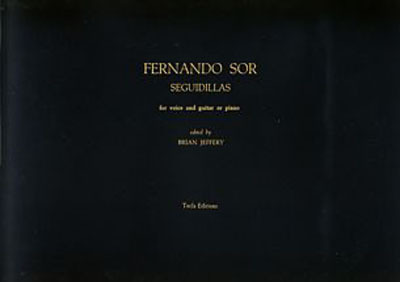 The book contains twelve songs, eloquent and sometimes humorous, composed by Sor in about the 1790s and 1800s in Spain, for voice with guitar accompaniment (some with piano). They take a significant place in the history of Spanish song and of popular song in general. Newly discovered and published in 1976 for the first time. The guitar accompaniments are mostly not difficult. We also carry the paperbound version.